The RI Asia Japan 2019 conference will focus on climate and SDGs. These two key themes will drive the narrative for regulators, companies and investors until 2030 and beyond. RI Asia Japan 2019 provides a platform to learn, share and debate on the key issues that are set to define every aspect of the investment landscape in the next decade. Additionally, in 2019, the RI Asia Japan conference is being restructured to deliver more advanced content, taking the discussion to the next level. After 5 successful years hosted by the Tokyo Stock Exchange, it is moving to a new home at Tokyo Midtown Roppongi. This means that in addition to the regular panels, interviews and keynotes, the conference can produce three specialist breakout streams offering 21 in-depth sessions presented by high-level experts. The Tokyo Midtown facility also allows the conference to substantially increase the audience capacity, enabling greater networking from a wider cross-section of industry leaders across the investment chain. 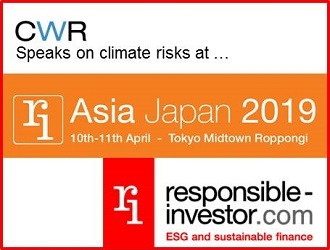 CWR’s Dharisha Mirando will panel in the session of “Global Climate – Overview: Impacts of Global Climate Change on Business” on 11 April (Thursday). For more details & registration please click here.